This is the super sweet doll quilt I got in my first ever quilt swap! Isn't it lovely and spring-y? 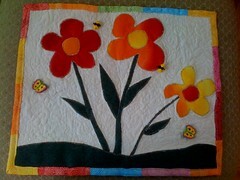 Susan did such a lovely job, and the butterfly and bee buttons are so cute. Now I owe her one - it's almost done, and I'll put up pics once I mail it off to her.